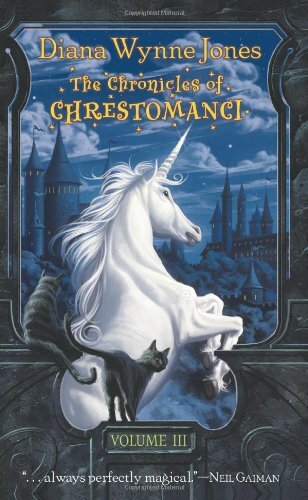 This is the third and last Chrestomanci review post. Check out the reviews for Volume 1 and Volume 2 if you missed them! In the multiple parallel universes of the Twelve Related Worlds, only an enchanter with nine lives is powerful enough to control the rampant misuse of magic–and to hold the title Chrestomanci. . . . Cat and Christopher Chant make the most unusual friends. Christopher befriends a boy with terrible karma in a mansion where everything keeps changing. Cat meets a girl whose family of rogue witches is hiding shocking secrets. Will the Chrestomanci be able to sort out the tangle of mysteries and magic? Now, THIS is my least favorite Chrestomanci book. Notice, however, that I’ve still rated it 3 stars. I mean, I don’t HATE it. But it’s my least favorite. But it’s still good enough to be 3 stars! I have such conflicted feelings about Conrad’s Fate. I think I know why, too: it’s so different from the others in style and tone. Maybe DWJ was trying something new? It’s in first person POV (and I don’t think I’ve ever liked DWJ’s first person POV stories). It ALSO does that thing that I hate where the narrator keeps mentioning things happening in the future while things are going on in the present (“Christopher would later tell me blahblahblah but right now the chef’s head is exploding,” to paraphrase). Ugh. And yet? I still finished reading it (again)? So I suppose even subpar DWJ books are still better than most other books. And since I got through this one with a minimum of grumbling maybe I should reread Hexwood again. I kind of remember not exactly liking it the first time I read it? Oh, I don’t know. WHY do I dislike DWJ’s first person POV stories so much? Maybe because I can’t help but picture HER as the “I” in them, like she’s doing some sort of weird self-insertion thing. That actually kind of works out with one of her short stories, where the narrator is a young girl, but in instances like Conrad’s Fate, where the protagonist is a teen boy…eh. I should note that I don’t have this problem with any other authors who use first person POV. Just with DWJ. Um? The first Cat book was written in 1977; this second one was written in 2006. That’s a long time between writing the same characters, and you can see the differences in DWJ’s writing from then and now. It’s ALMOST the same, but no-one can write in the same way for 30 years unless they’re a robot or something. So it’s Cat, but not quite the Cat from Charmed Life. Since I think The Pinhoe Egg takes place about a year since the events in Charmed Life, it almost works. People have changed, slightly, life at the Castle is just a bit different, etc. You can justify the differences if you think about it that way, maybe. I think if you read The Pinhoe Egg right after reading Charmed Life, though, you’d be confused a bit (or maybe that’s just me). Anyway, I like this one more than Conrad’s Fate (obviously) but not as much as the others. I think there’s just too much new stuff in here, and it’s all shoved together willy-nilly. There’s several new types of magic introduced, there’s tons of new characters mixed in with the old, there’s a truly horrific revelation at the end that not even DWJ could cushion in such a way that I could sleep easily afterwards, and all in all it doesn’t feel as self-contained as the other books did. It felt a bit like DWJ was retconning stuff, too, to fit in her new magical system thing with previous whatevers from the first book. I don’t really like retconning, to be honest, although if it’s done over a period of time (like in the Young Wizards series) I don’t mind it as much. idk, I think I just prefer the earlier books, even if I DO like Cat/Janet/Julia/Roger/etc. a lot and it’s nice to see what they’re up to. It’s still better than Conrad’s Fate, though. What? Crazysauce. I think Conrad’s Fate is excellent. I love seeing Christopher halfway between little Christopher and grown-up Chrestomanci, and the setting’s so fun and entertaining that I don’t mind about the plot being not very thrilling. Plus, it’s fun seeing Millie again. Maybe it’ll grow on me! I do like the parts you mentioned, but the rest of it…eh.